Sugar Mountain Resort 2018-2019 winter season pass is on sale. To order your season pass please call 800-sugarmt x 261. Want to be able to ski (or ride) anytime, day or night…the entire winter season? Then you need a season pass! And what better time to buy one than right now? Season Passes may be ordered over the phone by calling 828-898-4521 or visiting the Administration office Monday through Sunday, 8am – 5pm. Family members include spouses, and dependent children under the age of 21 who live with you, or dependent children under the age of 25 attending college, who have a valid college ID. Proof of family relationships may be requested. 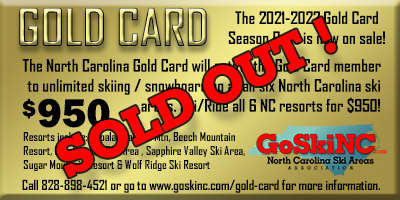 The 2018-2019 Gold Card Season Pass is now on sale!